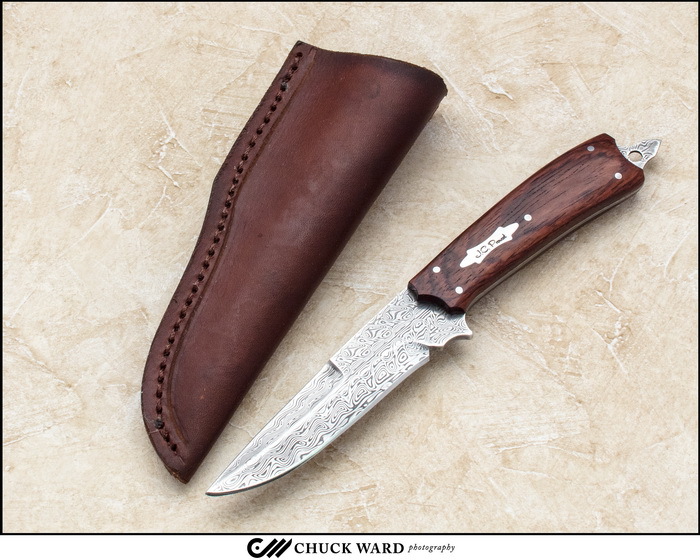 **** Chosen by Winner: John L.
Jim Provost has crafted one of his Fighters with a 4-inch clip point blade of Aegir Pattern Damasteeel Stainless Damascus. The full tang includes a "skull crusher." The handle is Kingwood. A leather belt sheath by the maker is included. I returned to work within two months after the stroke. I have great friends and supports! I am now 55 years old, retired, and work part-time as a consultant and knife-maker. I also work very hard to stay healthy by working out at the Wellness Center and eating the proper foods. If there is one thing I have learned and want to share with others, it would be to never quit and give up. I give God the credit for my recovery.